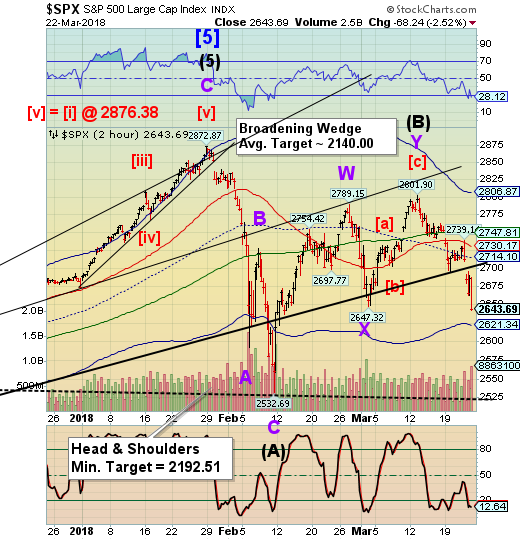 SPX futures challenged the Cycle Bottom support by declining overnight to 2718.50. It is now in bounce mode and may challenge the trendline today. The 38.2% retracement is almost precisely at the trendline at 2702.83 while the 50% retracement is at 2721.74. Mid-Cycle resistance at 2714.10 is a common retracement point. There is central bank intervention. The question is, how far can they retrace lost ground? NDX futures sold off to 6594.75 in the overnight before recovering its (overnight) losses. It, too is likely to bounce back to the combination mid-Cycle and 52 day resistance at 6816.16. That constitutes a 2% bounce likely to happen today. The interesting thing is that the 38.2% retracement is at 6872.92. ZeroHedge passes this on from Richard Breslow, “Don’t mistake this as a trade recommendation, but it is all right to do nothing. Trading when you believe you have an edge is when it is time to step in. If you are there, then go for it. But trading merely because things are moving around is a day-trading concept, not an investment thesis. It’s important to match trading style, objectives and realistic liquidity assumptions to how you view volatility vs risk. They are very much not the same thing. Made even more so if you think the Fed equity put has been eliminated. It hasn’t, just moved some. 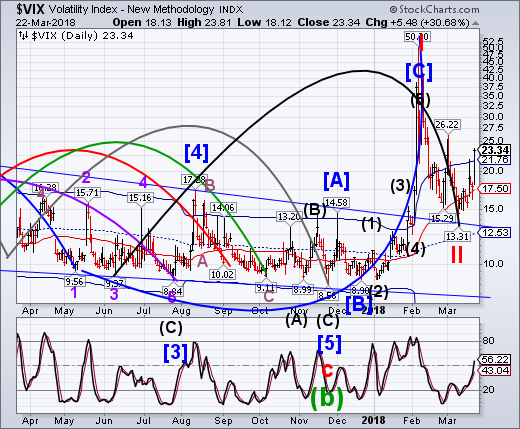 VIX futures have pulled back from an overnight high of 25.27. 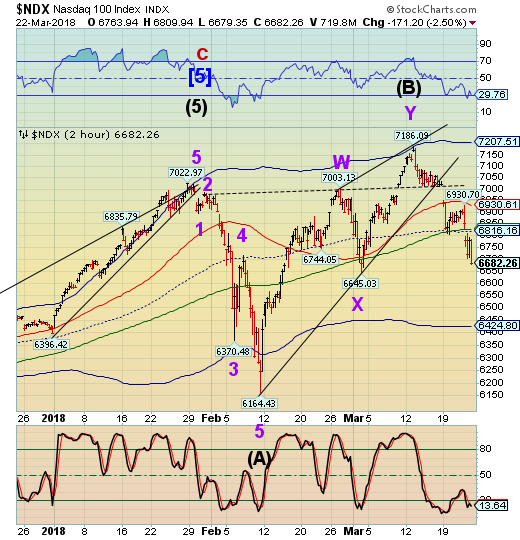 It appears to have completed a Leading Diagonal Wave (1). It may decline back to the 52-day Moving Average at 17.50, which is near the 61.8% retracement level (17.32). TNX bounced to 28.52 in the overnight session, but the bounce may be over. If so, the decline may resume. The normal target for this decline appears to be mid-Cycle support at 25.35. 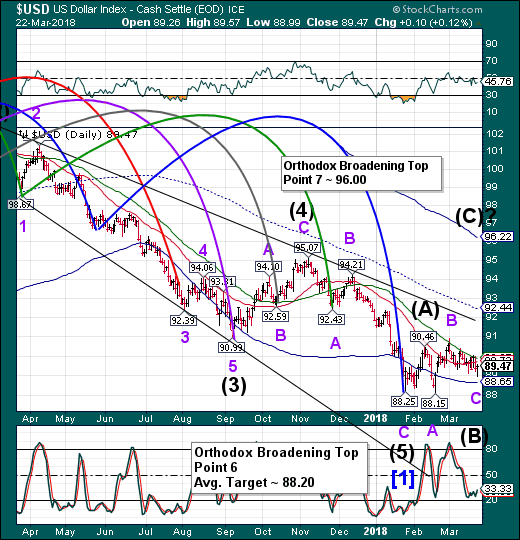 USD appears to have completed Wave C of (B) yesterday at 88.99 and is likely to begin its rally to the Point 7 target. 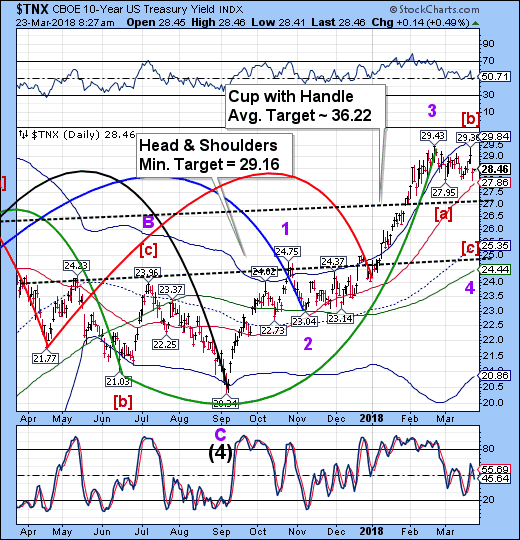 PoundSterlingLive reports, “The US Dollar could be set to rally against "risk" currencies in the coming weeks, according to Morgan Stanley, as markets respond to a decline in global risk appetite and a rise in short term market interest rates.